The Mineral: Pure silica sand is the basic mineral in Perma Color Surface Aggregates. Silica is an extremely hard abrasion-resistent, chemically inert mineral. Flooring surfaces produced using pure, high-density silica consistently show greater resistance to wear than surfaces filled with minerals of lesser integrity. Colors, Sizes and Blends: Fifteen colors are available in three different textures. In addition to these standard colors, Estes’ offers custom colors and blends, computer matched to customer specifications. 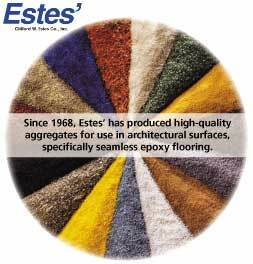 Estes’ also has two additional sizes in Perma Color Surface Aggregates called Super Trowel Rite and Ultra Trowel Rite. Application: Perma Color Surface Aggregates are ideally suited to any established method of application; troweling, broadcast or pourable self-leveling formulations. Traditionally rounded grain sands were thought to be best suited for broadcast application, experienced applicators find no difficulty troweling this type of aggregate. Similarly, Trowel Rite is not limited to only the trowel method of application. Density and Coverage: The density of Perma Color Surface Aggregates averages about 90 lbs. per cubic foot. Of course, coverage varies depending upon the thickness of the anticipated surface. Dek Rok Surface Aggregates opens new horizons to architects and interior designers. Experienced artisan-installers around the country can easily translate your designs into reality, incorporating logos, bold graphics, intricate borders and delicate color gradations. Dek Rok consists of tough quartz stones married to high-performance resins to yield a seamless, slip-resistant surface of unmatched durability, which is impervious to gas, oil and solvents. Although it is real stone, you will be surprised at the soft walk and enhanced sound-absorbing properties of a Dek Rok floor. Dek Rok will wear like the stone it is made from. No grout to maintain, nothing to fray, warp, chip or split. Applied to any stable subfloor, Dek Rok should retain an attractive appearance for decades to come. 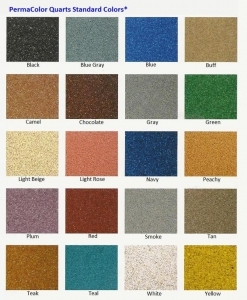 Dek Rok is available in 15 standard colors and can be blended on site.